Weber have a very deep history and the Smokey Mountain has been one of the best water smokers for almost 40 years. It was first introduced in 1981 and over the years has been slightly refined with new features and improvements. These include better materials to prevent rust, plastic handles instead of wood, a built-in thermometer and different sizes. But the core design has barely changed in all this time. That’s because it’s such a brilliantly iconic design. This is going to be much more than just a standard Weber Smokey Mountain review, because you probably know how good it is if you found this page. We’ll go over the good and bad, the differences in the models, the accessories and help you find the best WSM for you. 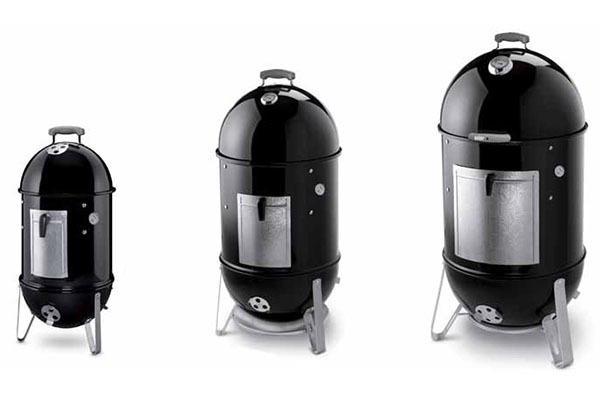 There are three different models of the Weber Smokey Mountain currently available. These are the 14.5 inch, the 18.5 inch and the 22.5 inch models. The inches represent the diameter of the cooking grate. All of these models have almost identical features and are designed the same. The difference being the size and a couple of other features like number of handles. Porcelain-enameled bowl, lid, center section and water pan. Like mentioned before, the main differences are in the physical sizes. The 14.5 inch model lacks the use of some of the accessories that the 18.5 inch and the 22.5 inch models are compatible with. 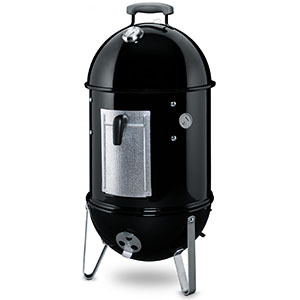 As we’ve mentioned before, the design of the Weber Smokey Mountain is one of the best of any smoker available today. It has barely been altered in nearly 40 years so that should tell you how good it is. It works fantastically well and is incredibly easy to use. 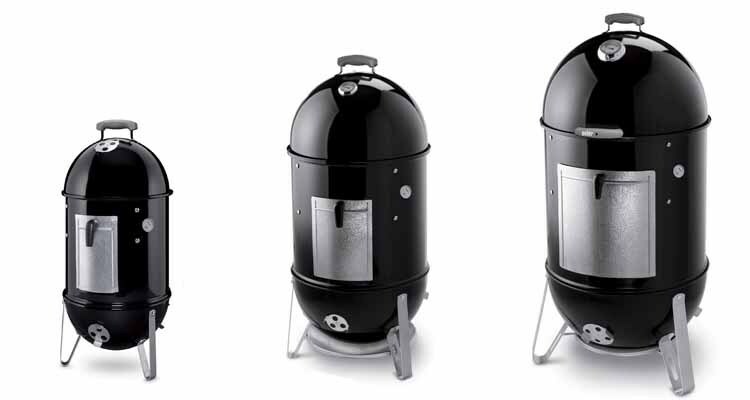 The main material used in the Weber Smokey Mountain is a porcelain enameled steel. This retains heat very well and allows the smoking to be as consistent as possible. The water pan is made from the same material and it all feels very sturdy. 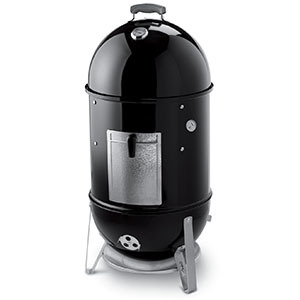 The construction is solid and it has a beautiful finish, making it one of the best looking smokers you can buy. The cooking grates are nickel coated for strength, resilience and to improve cleaning. The dampers are now made from aluminum to prevent any rust build up. On the most recent models there is a specially made heat-resistant nylon handle that works incredibly well. The one thing that we would have liked to see improved upon is the charcoal door. It still feels a bit too flimsy and can leak heat and smoke. Having been around for such a long time, you’re able to easily judge how the Weber Smokey Mountain survives in the long term. There are very few reports of any major malfunctions or serious problems. All of the problems were to do with rust around the dampers and the handles wearing out. Both of these problems have been fixed and Weber is so confident in the build that they are offering up to 10 year warranties on many of the parts of the Weber Smokey Mountain. The Weber Smokey Mountain is known for its ease of use. It’s a great beginner smoker and is regularly recommended to people looking to start BBQ smoking. 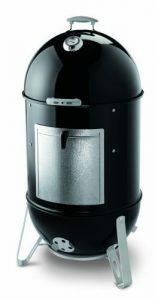 We also recommend it as a beginner smoker and think that it is almost too easy if you add in a temperature controller. Some of the features that stand out for ease of use are the charcoal door and the silicone grommet. The charcoal door allows you to easily add in more charcoal and tend to the fire and the water bowl without having to move the grills around. Whereas the silicone grommet allows you to insert a temperature probe, such as Weber’s iGrill, into the smoker without having to drill holes or clamp the lid down on the probe wire. It’s little things like this that make the Weber Smokey Mountain such great value for money. The Weber Smokey Mountain is a brilliant choice for beginners or people looking for a very cost efficient smoker. It’s also great for BBQ veterans and has been used to win several competitions around the world. It holds the internal temperature very well and require very little attention to produce perfect BBQ every time. For the price of the Weber Smokey Mountain you’re getting a huge cooking space. The 22.5 inch model has more cooking space than the largest Big Green Egg and is around $3,600 cheaper! Will give you some of the best tasting results you can get. As it’s charcoal it will produce authentic tasting BBQ and give you a great smoke ring. One thing we don’t like is that the lid isn’t hinged. This isn’t a huge problem but there is definitely an inconvenience with having to fully lift the lid off the smoker. Comparing this to something like a Kamado Joe, which has a stunning hinged lid, the Smokey Mountain is seriously lacking. This isn’t really a fair comparison due to the price difference, but when you have been using a Kamado Joe for a long time you notice the small inconveniences of the WSM. This problem is solvable though, there is a hinge available for the 18.5 and 22.5 models. Whilst we haven’t personally tried it out, it does have generally very positive reviews. The charcoal door is still a bit flimsy and can leak heat and smoke which can make temperature control more difficult. We’d recommend sealing up the door with a gasket kit to ensure temperature control is as simple as possible. Despite having a heat deflector underneath, we still think it’s necessary to place the WSM on something if you’re smoking on a deck or on grass. An automatic temperature controller such as the DigiQ DX2. Automatic temperature controllers allow you to convert your Weber Smokey Mountain into true ‘set it and forget’ smokers. They control the air flow into the smoker by using fans and thermometers to automatically maintain the ideal temperature in your smoker. The DigiQ DX2 is a great mid-range temperature controller but if you’re looking for something better, we’d highly recommend the Flame Boss. For more information on automatic temperature controllers for the Weber Smokey Mountain, head on over to our list and guide to the best automatic temperature controllers. 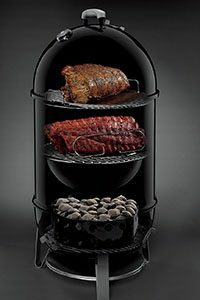 Weber make an expandable smoking rack that allows you to hang food in your smoker. This is perfect for fish, sausages or even beef jerky. A Rib Rack is becoming one of our favorite accessories for any smoker and it works perfectly with the Weber Smokey Mountain. It allows you to hold up to 5 racks of ribs on one grate. If a simple rib rack isn’t enough for you, then can we suggest the Rib-O-Later? This is the perfect accessory for cooking many long racks of ribs. Load up your slabs with your ribs then turn on the motor and allow it to rotate and cook your ribs perfectly. There is also a water pan cover available. This is a simple accessory that keeps the drippings from falling into your water pan. We recommend wrapping it in tin foil for a super easy clean up. Before you think about cooking on your new Smokey Mountain. You’re going to have to season it. Seasoning a smoker is basically where you heat it without any food in it to burn off any debris or oils on the inside of the smoker. We have a complete guide on how to season your new smoker so you don’t have to worry about doing it wrong. Using the free cover that you get with your WSM, make sure you keep it covered whenever you’re not using it. As the lid sits inside the main chamber it’s very easy for water to build up. Keep your cover on so this doesn’t happen. We recommend using a chimney starter and a wireless thermometer regardless of the other accessories you use. 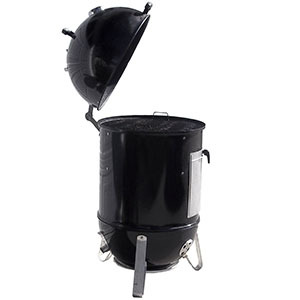 The chimney starter will make starting the WSM a breeze. And the wireless thermometer will allow you to monitor the internal temperatures of the smoker and the meat from wherever you are. We’ve written a complete guide to the best smoker thermometers so you have an idea of what thermometer is the best. We recommend adding some wood chunks to help add addition flavor to your smoke. Use our smoking times and temperatures chart to make sure you cook your meat to perfection. As you might have been able to guess, this is going to be another glowing review for the Weber Smokey Mountain. It’s brilliantly designed and built which allows it to maintain temperatures consistently and makes smoking very easy. They are almost perfect for both beginners and veterans, alike. The three different sizes give you a great range of options and will cover most budgets. Despite lacking a few features, the 14.5 inch model is still a great choice and has the added benefit of being much more portable. The two bigger models are both fantastic and give you so much cooking space that you’ll find yourself soon having spent more money on meat than on the smoker itself. Virtual Weber Bullet – You’ll be able to find answers to almost any question related to the Weber Smokey Mountain here. The Virtual Weber Bulletin Board – A forum that is part of the Virtual Weber Bullet. There’s millions of posts and a lot of invaluable information. Weber – All the information from the manufacturers themselves.